Doctor Who is an inherently political show—it’s about a character who goes around overthrowing governments and thwarting invasions. But over its 52 years, Doctor Who has not been afraid to feature political messages—sometimes very overtly. Here are the seven least subtle messages from Doctor Who. Despite it being so new, we may as well include Doctor Who’s most recent—and one of its most-obvious—pieces of political commentary. After all, it did inspire this list in the first place! This two-parter starring the shapeshifting Zygons aired over the period of the last two weeks, and each part dealt with different mediations on hot button topics with, quite frankly, all the subtle of a Zygon-shaped brick through the window. Invasion is perhaps the most obvious of the two to a wider audience as it dealt with the idea of housing 20 million Zygons, in disguise as ordinary humans, across the United Kingdom (include a rogue group who want the freedom to live as their usual alien selves). Peter Harness’ script loosely draped the Zygons over a commentary on the ongoing migrant crisis in the European Union—especially in regards to integration. And when it came to the rogue sect of Zygons, many people saw parallels to ISIS and the radical elements among immigrants. At one point, after watching an online video of the Zygon High Commanders being executed by Zygon rebels, UNIT commander-in-chief Kate Stewart advocates bombing a village (located in the just-about-fictional country of Turmezistan) being used to train Zygons, The Doctor snarls “This is a splinter group... you start bombing them, you’ll radicalize them all!” at her. All sounds a bit familiar, doesn’t it? Aside from it being outstandingly performed by Peter Capaldi, it resonated for one particular reason: it aired the day before Remembrance Sunday in the UK, the annual remembrance of fallen soldiers in global conflict since the end of the first World War. Doctor Who has always tried to put a science-fictional veneer on contemporary issues, but the Third Doctor’s era on the show was perhaps the most consistent in this regard. Set in a period where the Time Lord couldn’t travel through time and space in his TARDIS, The Doctor teamed up with the modern military/scientific organization UNIT to fight threats to Earth. Not every Third Doctor story was stuck on Earth, though. Connected only by their setting—the alien planet of Peladon—the two completely different tales both touched on big political issues in 70s Britain. Curse revolved around Peladon’s entry into a Galactic Federation—an overt commentary on the United Kingdom’s own then-ongoing debate about entry into the European Economic Community, which was supported by the Conservative government. Although the story doesn’t quite come down on one side or the other (the plot focuses on the planet’s High Priest murdering his political rivals, to try and prevent Peledon’s entry into the Federation), at the time, it was more than obvious about what it was referencing. The sequel, “Monster,” also drew heavy inspiration from Britain’s political climate. It was a story about the somewhat ho-hum topic of mining disputes between Peladon’s workforce and the planet’s King, but it was broadcast during a period of actual mining strikes. The show aired during a tumultuous debate between the then-Labour Government and the National Union of Miners (mining was a major industry in the UK at the time). Producer Barry Letts, who managed the show for all of the Third Doctor’s tenure, was a committed Buddhist and Environmentalist—and although as I mentioned this era of the show was already known for ripping story elements from British headlines, The Green Death represents one of Doctor Who’s least subtle stories about the perils of damaging the environment... in which pollution leads to giant maggots. With the bad guys being fronted by a company called the wonderfully generic (and wonderfully obvious) “Global Chemicals”, “The Green Death” sees said company pump a Welsh mine full of discarded chemical sludge, creating an army of gigantic insects that began offing the local residents. At the same time, anyone who touches the sludge turns bright green and starts glowing. The Doctor’s closest allies in the story? The Wholeweal commune, a Greenpeace-esque group of hippie environmentalists. The Sun Makers isn’t just unsubtle, it wears its unsubtlety on its sleeve with an unabashed pride. The story came to writer Robert Holmes after he received a hefty tax bill from the Inland Revenue (the British equivalent of the IRS) that had him seething. Instead of being the originally planned story of anti-colonial sentiment on the planet Pluto, Holmes turned “The Sun Makers” into a story about the nefarious Company—which owns the artificial Suns sustaining life on Pluto and uses that power to extort workers with ever-increasing taxes. With the main villain being a seaweed-esque creature who loves money, the story even begins with the Doctor and his companion Leela stopping a man from attempting suicide because he’s just seen his new tax bill. It’s not exactly difficult to see whom Holmes had in his sights. What, you mean a story about farting green aliens that look like fat people and explode if you chuck vinegar at them wasn’t an exercise in subtlety? Well, I never. Writer Russell T Davies wasn’t afraid to root his re-imagining of Doctor Who in the contemporary—a modern companion for a modern Doctor, and stories that were largely set on Earth in the present and near-future helped seal that idea. But this also allows Davies to make some rather obvious digs at U.S. foreign policy as well—one of his frequent favorite targets. Aside from being set inside 10 Downing Street, the home of the UK Prime Minister, the two-part story infamously features a moment where an alien Slitheen disguised as the Prime Minister demands access to nuclear launch codes in order to combat a supposed alien invasion force. In reality, the aliens want to launch our nukes to start a nuclear war that would leave irradiated slag for it to sell—because it’s Doctor Who. But the disguised Slitheen tries to get the codes by claiming that the aliens have “massive weapons of destruction” that are capable of launching at Earth in 45 seconds. This is a blatant callback to British Prime Minister Tony Blair’s claim that Iraq had access to “Weapons of Mass Destruction” capable of launch in 45 minutes, before the US-and-UK lead invasion of the country in 2003. You see what he did there? Peter Harness’ second entry on this list comes from his first episode for the show: last year’s Kill the Moon. Revolving around The Doctor and a team of Astronauts investigating spider-like parasites threatening to shatter the Moon into pieces, it quickly devolved into a widely-mocked pseudoscience story that ended in the Moon being the egg of a giant space creature. But while the episode was mocked for the sudden jolt of unconvincing science, some political commenters took it as an obvious commentary on abortion, advocating a Pro-Life stance: before the creature hatches, The Doctor’s companion Clara asks the population of Earth whether the alien “baby” should be allowed to live (destroying the Moon and potentially bringing about the end of life on Earth), or be killed before it can be born. The planet overwhelmingly votes to terminate the creature, before Clara decides to override their decision and save the alien’s life. Pro-Choice advocates immediately lambasted the series and the BBC for the story, while most people were simply content to mock the episode for its awful science. Perhaps Doctor Who’s least subtle allegory, and one of the least subtle overall in the entire history of allegories, is also its strangest. “The Happiness Patrol” only managed to cause a political kerfuffle 22 years after its broadcast, despite being plainly obvious in its aims. The Happiness Patrol’s political commentary is two-fold. Some people see the story as having a gay subtext. And the story of a tyrannical female despot who has outlawed being miserable, with a punishment of death appears to be an allegory to the then-recently introduced Section 28 by the Conservative government, banning local government councils from promoting homosexuality. But it’s the despot herself who is the most obvious pastiche. Sheila Hancock openly plays the leader Helen A as a satirical take on then-Conservative Prime Minister Margaret Thatcher, the “Iron Lady” who dominated British politics. 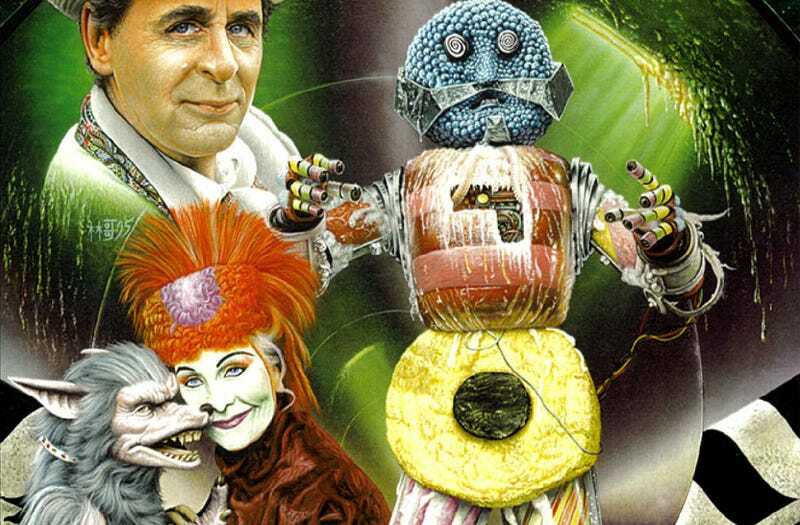 At the time, this barely made ripples, but a 2010 story in the British newspaper The Sunday Times about the connection—featuring a quote from Sylvester McCoy describing Mrs. Thatcher as “more terrifying than any monster the Doctor had encountered”—saw Conservative politicians in uproar at the anti-Conservative bias this revealed on the part of the BBC. Ex-script editor Andrew Cartmel was brought onto the BBC news program Newsnight to answer claims that the 1980s Doctor Who creative team had been a source of left-wing propaganda in the wake of the “revelation”... despite the story having been no particular secret, 22 years earlier. The biggest controversy at the time? The fact that “The Happiness Patrol” featured a now-infamous villain made out of candy called the Kandyman. Confectionery manufacturer Bassetts decried the obvious similarities to its liquorice allsorts mascot Bertie Bassett and, following a BBC investigation, the Corporation demanded the monster was never to be used again. Man, what a story.